recommended for: Fans of If You Find Me by Emily Murdoch, Speak by Laurie Halse Anderson, or Law and Order: SVU. People looking for a powerful, psychologically rich story. This was a fascinating and emotionally harrowing read, in the best way. Like If You Find Me by Emily Murdoch, Pretty Girl-13 deals with the devastating aftermath of trauma and recovery. 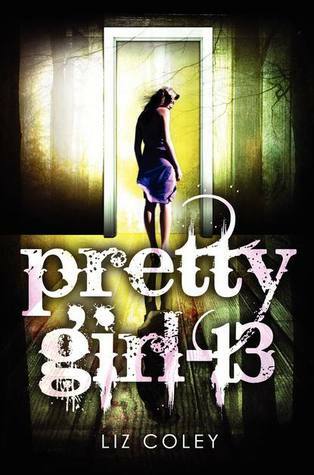 Like Murdoch's Carey, Angie has been held captive for three years; now sixteen, she stumbles back home, broken and alone. However, Coley's character Angie has a post-traumatic twist: she still thinks she's thirteen. The plot deals heavily with Angie's struggles to realize that the girl in the mirror is her, to reintegrate with her traumatized family, and to find out just who lived her life for three years. The "who" turns out to be several "whos"--alternative personalities who lived Angie's trauma for her and now battle to keep her in the dark. The portrayal of Dissociative Identity Disorder is (for the most part) admirably accurate, down to the way some of Angie's other personalities try to communicate her, to warn her, while others take control violently and turn her into someone else. I rooted for Angie as she tried to reclaim her life and struggled with slowly realizing the horrors she had been through those three years--and other secrets she'd never dreamt of. The role of family and friendships is also crucial here; I really enjoyed that the plot was as much about Angie learning to be a friend and daughter again as it was about her hidden trauma. What I didn't like for spoilery reasons is the end. I thought it was too sensational and not necessary. There was also a bit of crazy brain technology that is totally implausible. But other than that, this was an exciting, thought-provoking book that successfully avoided being exploitative and instead portrayed trauma sensitively and richly. All in all, this book nearly had me peeking ahead. It was so hard not to! I loved that Angie got the details slowly, because I felt like I was right alongside her, looking for clues and making horrible discoveries. The tension was high through the whole thing. And, except for the weird sci-fi brain stuff and the brevity, the process of reintegration therapy is really well done. I also liked that the mystery bits alternated with scenes of regular life: going back to school, facing her old friends, getting close to boys, struggling with her father's guilt. It touched on the after-effects of trauma that you don't usually see. Like I said, my biggest beef was with the ending, which was just a little too coincidental and totally unnecessary. Coley takes a view on the post-traumatic landscape that's often attempted and rarely done well. DID (Multiple Personality Disorder, which is NOT SCHIZOPHRENIA SERIOUSLY GET IT RIGHT, PEOPLE) is sensationalized in the media to the point of absurdity. Coley, on the other hand, obviously did her homework. The alternate personalities she portrays are richly developed and mimic real accounts of the disorder. They're also not superfluous; they drive the story and allow for a mystery in Angie's own head. Her frustration at having all the answers locked away by other pieces of her mind is a thrilling and terrifying driving force for the plot. There are so many extra characters in this, because not only do we get Angie, but we get her alters. Each of them are a distended part of her, but also feel like people in themselves. It makes for really interesting scenes with Angie sort of communicating with herself and feeling broken and dashed to pieces. Angie's plight is easily sympathetic, and she's an endearing character in herself--sweet, sensitive, and hugely determined. Her struggle to control the behaviors of her alters and learn this new self showed a lot of strength. Her parents are also very realistically portrayed. They're not only joyful at her return, but filled with guilt and doubt and confusion. It was also nice seeing some of Angie's old friends coming back to her. Some weirdly fast, but maybe that's how best friends work. There was also an adorable boy who played a very appropriate and non-overstated role. Coley's writing in this was key. She did a good job writing Angie's voice as torn between the young girl she thinks she is and the older girl she's become unwittingly. It could be very rich at times, and pretty, and disturbing. She did a great job of giving each alter their own, unique voice. The story was very polished, with good pacing. It never felt too draggy or too fast-paced. There was just the right tension all the way through, with mini-climaxes and drops to keep you on your toes. A powerful story about one girl's struggle to put the pieces of herself back together after an unspeakable trauma. I have an ARC of this book that I never got to read :( Looks like you liked it a lot. Gonna move it up! I absolutely loved PG-13 but not If You Find Me. I found them to be totally different.